Raging Rhino slot by WMS is a safari-themed slot that came out in 2014 and has been hugely popular with serious slot players ever since. Why? Well, partly because it has a massive 4,096 ways to win, driven by a (at the time unique) 6 reel and 4 row set up where any 2 adjacent identical symbols trigger a win (4x4x4x4x4x4 = 2,096). 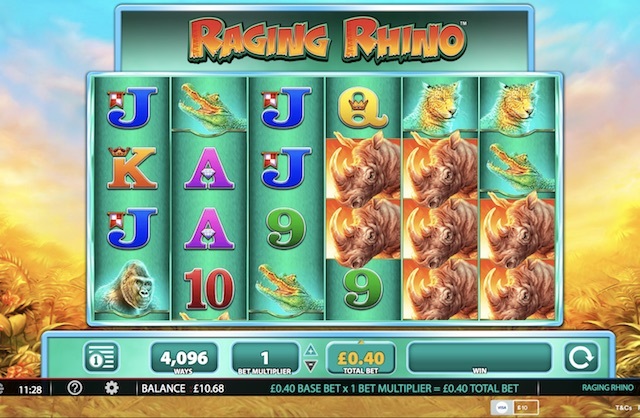 But Raging Rhino is also notorious because it is a highly volatile slot with a 95.91% RTP featuring a bonus round with up to 50 or more free spins – depending on how many scatters you land before and during the round. There are also wild multipliers in the bonus round that can increase your win 3x when they pitch. As a result, despite baron runs of dry spins, the game has it in it to reward the patient player with massive payouts. But there’s the rub – it requires patience, guts, and a large bankroll to go chasing those big wins down. So beware, this machine can churn through your cash quickly. That said, it’s not popular for no reason and if you’re up for the challenge, it’s a lot of fun. 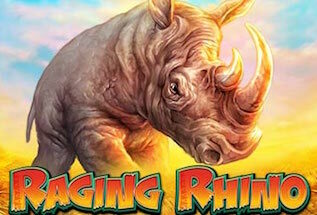 You can play Raging Rhino for free or for real on desktop, tablet or mobile at one of our recommended casinos, or read on for our full review of this game. Raging Rhino is set in the African savannah. It has a crisp and elegant set of graphics and clear soundtrack. In this respect it is a cut above many of the other WMS games we have looked at. The symbols in the game are cards 9 through Ace, and a selection of animals, including crocs, apes, cheetahs, and of course the Raging Rhino. This is the top-paying symbol with 7.5x bet for 6 in a line. The scatter symbol that triggers the free spins is the diamond and the wild symbol is the tree. The configuration of your bet is done using the Bet Multiplier at the bottom of the game screen. Minimum bet is 40p per spins, and you can set upwards from there by increasing the multiplier as far as 150x to a £60 per spin. Sounds can be triggered on and off in the settings. The base game ticks along nicely and you can pick up some reasonable wins here. However, it is the free spins round where big payouts potentially lie. To trigger the Free Spins you will need 3 or more scatters (diamonds). 3 scatters gives you 8 free spins, 4 gives you 15 spins, 5 gives you 20 spins and 6 fives you 50 spins. Within the bonus round you can trigger more spins with just two or more scatters. Here, 2 gives you 5 free spins, 3 gives you 8 and so on. Wilds (the tree symbol) also are important in the bonus round too. Here, when they appear in a winning line they turn into 2x or 3x multipliers. And they accumulate too, so 2 wilds with 3x multipliers becomes a 6x multiplier. This is where the big wins can come in. Raging Rhino slot by WMS has been a favourite amongst high roller slot players since its launch in 2014. If you play with big stakes its certainly not for the feint-hearted and it can burn massive bankrolls quickly. However, if you can put up with the long periods without a win, then the rewards when they do come can be fantastic.